Well she’s obviously doing it wrong. 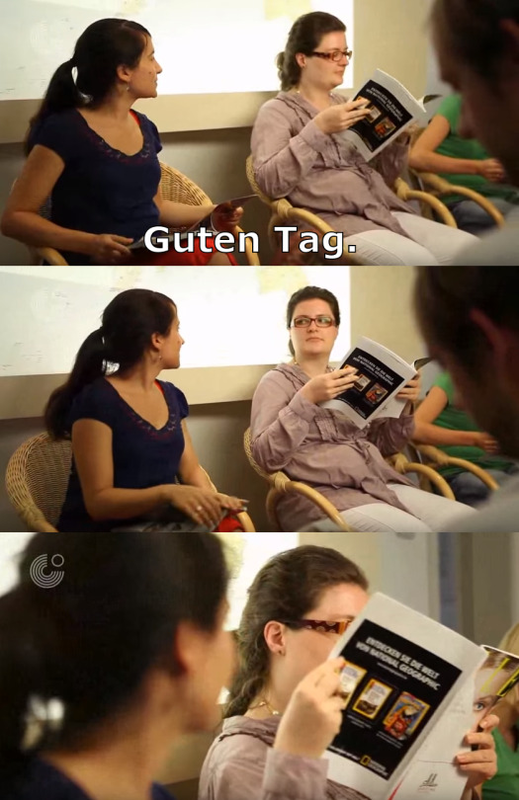 You got to mumble “Guten Tag” in no one’s actual direction upon entering the waiting room. Then you don’t speak a word (you gotta grab a magazine though, because if you’re on your mobile people will find that asocial) until the doctor calls you and when you get back to retrieve your jacket you mumble “Auf Wiedersehen”. You’re trying to make small-talk. See also: when entering a crowded bus, tram, subway or train, you do not say a single word. You look for an empty bench. If there are none, you will have a neighbour. You stop at an empty spot and mumble something like “tschulli-ng” or “s-nch-frei?” to the person occupying the other spot on the bench. You nod in an upward direction. They reply a mumbled “türlich” while vaguely looking somewhere near your face and moving their bag if neccessary. You sit down, nod gratefully, and keep your mouth shut for the rest of the ride. Neither of you wanted this. You wanted freedom. Don’t bother each other. If an entire bench in front of you becomes available at the next stop, though, it is not the polite thing to free your neighbour and yourself up. No, you stay right where you are. The silent stranger next to you is your silent stranger now. Welcome to Germany. This is how we express love. None of these people are joking. And if you’re the one sitting at the window and you want to get off at the next stop, you begin to loudly rustle with your bag whatever, because that way you can signal the other person that you need them to get up without having to speak to them. So… that’s not how is it done in other parts of the world?